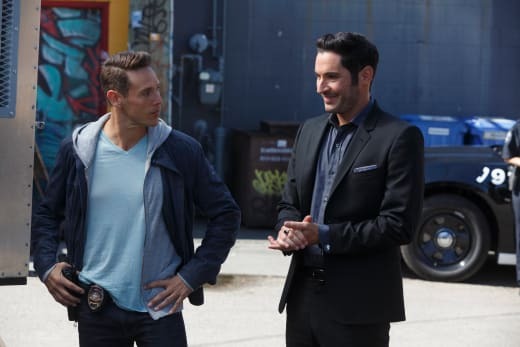 It's all about being yourself on Lucifer Season 2 Episode 7 as Lucifer teams up with Dan, and Maze finally finds the job of her dreams. I'm not sure how I feel about the case of the week. Are we supposed to care about Chloe's dad? It was important to Chloe and by extension became important to Dan and Lucifer. Still, it's hard to get attached to something we've barely been exposed to. However, the case provided a great way for Dan and Lucifer to bond, something we'd never thought we'd see. And the way Lucifer went about it was pretty hilarious. After his fiasco with Dr. Martin, it makes sense that Lucifer would want to try to feel "normal," because her reaction to his true form really made him feel bad about himself. But, as much as it bothered him at the end of Lucifer Season 2 Episode 6, he seemed to have bounced back pretty quickly. No more disheveled Lucifer. Lucifer was back to his old self. Lucifer doesn't really have any other role models to copy, so Detective Douche was his only choice. 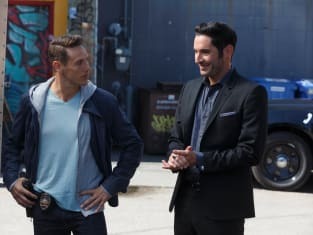 And while it was an odd choice, especially considering how much Lucifer has hated Dan in the past, it made it all the more fun watching Lucifer following Dan around like a puppy dog. 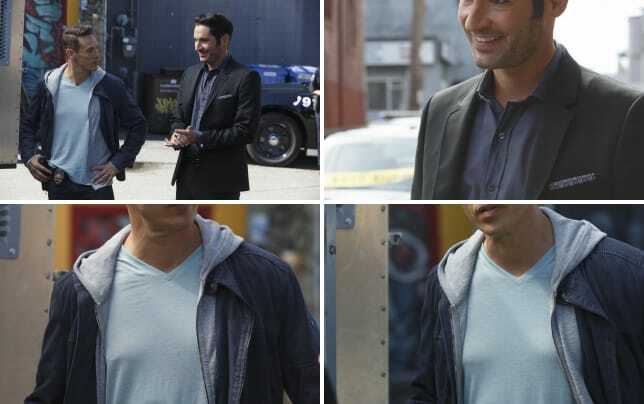 When Lucifer started copying Dan's movements in the interrogation room with Chloe it was great, but the best part was Dan's reaction when Lucifer showed up dressed almost exactly like him. How hilarious was that? Lucifer can be such a child at times, but it's so endearing. I really liked how through their strange form of bonding, they became closer. They started to understand each other, and in the end actually had respect for each other. While Lucifer was envious of Dan's "normality," Dan was envious of Lucifer's life of luxury. The scene at the Improv of them talking it out, was great. In fact, every moment of them together was great. Them talking heart to heart was the cherry on top. No. Not true. The cherry on top was definitely the bath house scene when they both showed up shirtless. Holy Hell. Talk about eye candy! Maze going on an interview for a preschool aide? Can you even imagine? I would have loved to have seen that interview. Trixie's reaction to that announcement was priceless. I know I've said it before, but Trixie is awesome! We need Trixie in every episode, even if it is in small doses. It was heartbreaking to watch Maze be rejected by Dr. Martin. Linda's reaction to the whole thing is understandable, yet if she wanted to know the truth, why is it so hard to accept the truth? Nothing has changed. They haven't changed. So, why not accept it for what it is. Maze was trying to find some way to fit in. She even tried for a job as a maid, dressing the part and all, but the kind of cleaning she thought she'd be doing was not the kind of cleaning she interviewed for. Maze becoming a bounty hunter was the perfect fit, and I'm glad that Maze didn't give up on Dr. Martin. It might be a little awkward for Dr. Martin for a while, knowing the truth behind Lucifer and Maze, but it seems like she just might be able to move past it. There was a lot of hugging going on. Best hug of the night goes to Lucifer and Chloe. How hilarious was it when Lucifer took on an American accent in the bath house? Dan was a lot more tolerant of Lucifer than I thought he'd be. We got a little dose of Ella this week. What exactly are they trying to do with this character? She's becoming inconsistent. Did Dan even notice the scars on Lucifer's back? How soon before Lucifer reveals himself to Chloe? What did you guys think of "My Little Monkey"? Hit the comments and share your thoughts. If you missed any of the fun, you can watch Lucifer online right here via TV Fanatic. Lucifer Photos from "My Little Monkey"